As we’ve mentioned in previous blogs, installing an outdoor fireplace at your Jacksonville home is one of the easiest ways to improve its value and create an exterior room that can be used all year long. C & L Landscape is a well-known installer of outdoor fireplaces and kitchens in the Jacksonville area, and if you’re thinking about making this kind of addition to your home, we’d love the chance to provide you with a FREE consultation. However, if you’ve already had a wood-burning outdoor fireplace installed at your Jacksonville home, you might be wondering about just how exactly you can keep it in good working order. That’s the experts at C & L Landscape have put together a few backyard ideas that will help you maintain your outdoor fireplace. Only Burn Wood In It! You’d be surprised how many people treat their outdoor fireplace like their own private incinerator. Resist the urge to burn yard waste, paper trash, or other miscellaneous items in your outdoor fireplace. Only actual firewood should be burned in your wood-burning fireplace! After your wood has been completely burned there will be a little pile of ashes left in its place. Be sure to sweep this pile into the trash or a compost bin immediately. If you forget this step and burn fires on a regular basis, you could soon develop a massive pile of ashes that will make it difficult to light future fires. No matter how well you clean the hearth, you need to have the chimney portion of your outdoor fireplace cleaned at least once a year. This will prevent build up from forming on the inside of the chimney, which eventually becomes a fire hazard. Armed with these ideas for keeping your backyard fireplace clean, you should be able to enjoy your outdoor living space for years to come! 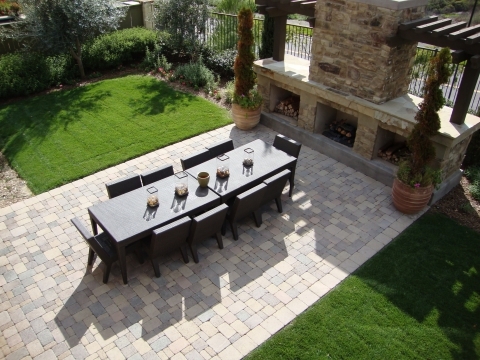 And remember, if you’re looking for more ideas that will improve the ambiance of your backyard, contact C & L Landscape for an outdoor fireplace consultation.